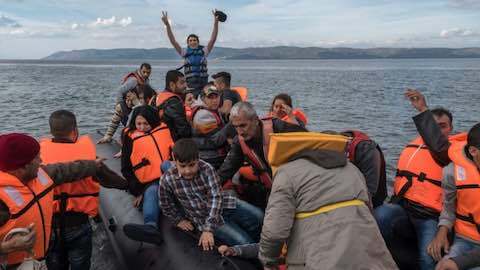 Although only 8-15 kilometers of water separate Lesbos from Turkey, the crossing is not without danger. I spent three days on the island in mid-December. Two small inflatable dinghies carrying dozens of migrants capsized in that short period due to the choppy seas and the fragile armature of the boats. Two members of Iraq's Yezidi minority, an elderly man and an 8-month-old baby girl, drowned on the second day, and several others had to be treated for hypothermia, shock, bruises and injuries. Instead of putting fact and law aside to ride populist or nationalist sentiment and become pawns to political brinkmanship, EU politicians need to put reason and rights center-stage to inform the debate, not inflame it. Some were raised on the grimmer side of the Iron Curtain -- Hungary in 1956, Czechoslovakia in 1968, Poland in 1981 or all of Eastern Europe in 1989, or in the right-wing dictatorships of Greece, Portugal, or Spain in the 1960s and 70s. And yet they need to be reminded, time and time again, that they were greeted with open arms in time of need, not with fences and closures. They were embraced as victims claiming long lost liberties, not rejected on the fear that they were Communist or Fascist agents, agitators, or infiltrators. In Lesbos, I met Fatima, 39, a Sunni from Baghdad, who was fleeing with her three children the vengeful sectarian violence that Shia militias had unleashed against the Sunnis in Iraq. The family only made it to Lesbos after two failed crossings. She left her husband behind in hiding with the hope that he will eventually join them in Germany, where she intends to apply for asylum. "I pray for his safety every day and look forward to the day when we will be together again," she told me. Mahmoud, 26, along with his wife and daughter, had first suffered the barrel bombs dropped by the Bashar al-Assad regime on rebel-held areas of Aleppo (Syria). They managed to cross the frontlines to the state-held zone, where their new dwelling miraculously remained standing after indiscriminate mortar attacks by the rebels had hollowed out the adjoining buildings. "We were surrounded by bombed buildings and were no longer willing to tempt fate," he said, describing why they finally left. In the absence of coordinated policy and shared responsibility in addressing the plight of the refugees, the EU has facilitated criminal and informal organizations to strike it rich in the land of Croesus. As well as making the crossing dangerous and onerous for the refugees, it runs against Europe's own best interests and security. "A Cemetery of Life Vests But Not Lives"